A migrant mother walks with her two daughters on their way to the port of entry to ask for asylum in the U.S. on June 21, 2018 in Tijuana, Mexico. The lawsuit would be filed in the U.S. District Court in Seattle. Massachusetts, California, Maryland, Oregon, New Mexico, Pennsylvania, New Jersey and Minnesota are joining the lawsuit. A U.S. judge in San Diego is considering whether to issue a nationwide injunction sought by the American Civil Liberties Union. Washington and more than a half-dozen other states said Thursday that they plan to sue the Trump administration over a policy of separating immigrant families illegally entering the United States. Washington Attorney General Bob Ferguson made the announcement Thursday outside a federal prison in the city of SeaTac, south of Seattle, where about 200 immigration detainees have been transferred — including dozens of women separated from their children under the administration's "zero tolerance" policy. It calls for prosecuting all migrants caught illegally entering the country. Ferguson said the separations violate the due process rights of children and their parents and that President Donald Trump's executive order Wednesday halting the practice has not resolved the legal concerns. "This is a rogue, cruel, and unconstitutional policy," Ferguson said. "We're going to put a stop to it." The states set to join Ferguson's lawsuit are Massachusetts, California, Maryland, Oregon, New Mexico, Pennsylvania, New Jersey and Minnesota. New York has separately announced plans to sue. Ferguson has repeatedly challenged the administration, most notably when he successfully sued to block Trump's initial travel ban against several mostly Muslim countries. It caused chaos at airports when it rolled out in January 2017. A third version of the policy took effect but the U.S. Supreme Court is considering it. Ferguson and Washington Gov. Jay Inslee expressed alarm after learning last week that U.S. Immigration and Customs Enforcement was transferring some detainees to federal prisons, including dozens of mothers who had been separated from their children to the Federal Detention Center at SeaTac. "The Trump administration's new family separation policy is inflicting intentional, gratuitous, and permanent trauma on young children who have done nothing wrong and on parents who often have valid claims for refugee or asylum status," they wrote in a letter to the administration. 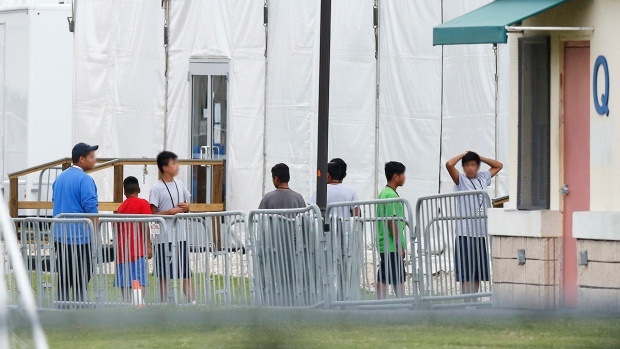 A U.S. judge in San Diego is considering whether to issue a nationwide injunction sought by the American Civil Liberties Union that would order the administration to reunite 2,300 children with their parents. The House of Representatives is set to vote on two comprehensive immigration bills Thursday - one by House Judiciary Chairman Bob Goodlatte that is popular with immigration hard-liners, and a second measure that reflects a deal between GOP conservatives and moderates. The compromise bill would provide nearly $25 billion in funding for President Trump's border wall, limit legal and illegal immigration and provide a path to citizenship for DACA recipients.